Despite their central role in many forms of music-making, drummers have been largely neglected in the scholarly literature on music and education. But kit drummers are increasingly difficult to ignore. While exponents of the drum kit are frequently mocked in popular culture, they are also widely acknowledged to be central to the musical success and aesthetic appeal of any musical ensemble in which they are found. Drummers are also making their presence felt in music education, with increasing opportunities to learn their craft in formal contexts. Drawing on data collected from in-depth interviews and questionnaires, Gareth Dylan Smith explores the identities, practices and learning of teenage and adult kit drummers in and around London. As a London-based drummer and teacher of drummers, Smith uses his own identity as participant-researcher to inform and interpret other drummers' accounts of their experiences. Drummers learn in multi-modal ways, usually with a keen awareness of exemplars of their art and craft. The world of kit drumming is highly masculine, which presents opportunities and challenges to drummers of both sexes. Smith proposes a new model of the 'Snowball Self', which incorporates the constructs of identity realization, learning realization, meta-identities and contextual identities. Kit drummers' identities, practices and learning are found to be intertwined, as drummers exist in a web of interdependence. Drummers drum; therefore they are, they do, and they learn - in a rich tapestry of means and contexts. Contents: Foreword; Preface; ’I drum, therefore I am’? ; The snowball self; Learning to play drums; The snowball self in motion; A part and yet apart; Ethnicity and cultural heritage; Gender and drumming; Conclusions; Appendices; Bibliography; Index. 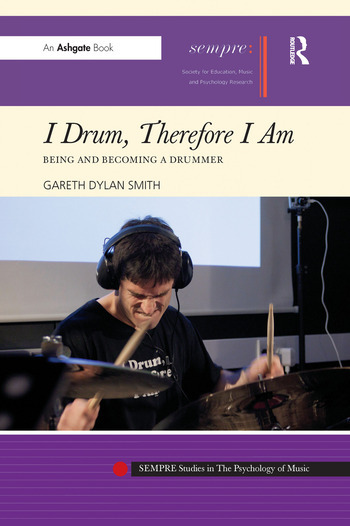 Gareth Dylan Smith is a drummer, teacher and scholar based in London, England. He plays mostly rock, punk, folk, blues and musical theatre, and has performed, taught and presented his research on four continents. Gareth writes for DrDrumsBlog.com and is Editor at SUS Music. In his 41-year career, Bill Bruford, who has generously provided the Foreword to this volume, has played with Yes, King Crimson and Genesis, as well has his own groups, Bruford and Earthwords. Bruford retired from public performance in 2009, but he continues to be active as a speaker and lecturer.